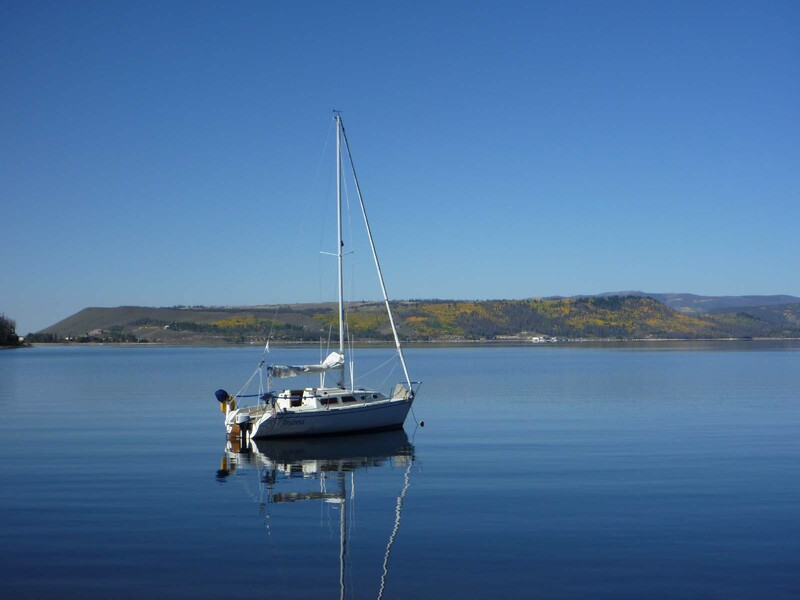 Lake Granby Yacht Club | LGYC is one of the highest yacht clubs in the world! At 8280 feet, LGYC is one of the highest-elevation yacht clubs in the world. Lake Granby nestles under the shoulder of the towering Continental Divide, deep within the Rocky Mountains. Granby, together with neighboring Grand Lake and Shadow Mountain Reservoir are the headwaters of the Colorado River, which here begins its run to the Sea of Cortez. Admittedly, the members of the Lake Granby Yacht Club have as much interest in cruising and socializing as they do in racing … but that’s not to say we haven’t got some very tough racers among us … including one or two with national standing. We’ve had folks race right through ear-cracking lightning, heeled-to-yer-gunnels downbursts, and pound-you-flat-to-the-deck hail. Hey, one racer even kept right on going after a massive “surprise tack” when hit by the only waterspout we’ve ever seen on the lake. Still, we do take the “Avoid Collision” rule seriously! We’re out there to push our skills, not each others’ buttons.